Wooli beach’s report card for the last year is now complete and confirms 2013-14 to be a year of growth particularly in front of the village. You may recall the first part of the report came in September when our Beach Survey Trends showed steady growth in beach height and sand volume. The survey’s 3-monthly view is now confirmed by the hourly view from the Coast-Cams on the water tower which reports significant growth in beach width. That overall beach width grew (or accreted) over 16 months from March 2013 to July 2014. This overall trend also happened over the 28 month period from March 2012 to July 2014. There is good agreement between the data from the camera system and that from the beach surveys on beach growth. The camera system was operational for approximately 95% of the time compared to 85% in the first year. If you’d like to know more from Coast-Cams read the Summary Report and to get the complete picture here’s the Full Report. 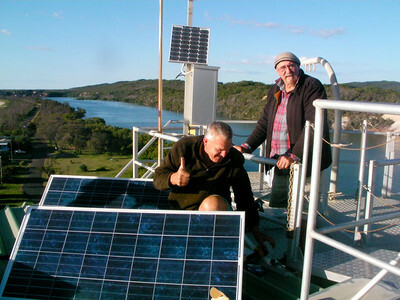 Seems like just yesterday that Dr. Shaw Mead (eCoast) helped by CCPA members and Council staff set up the computerised camera system atop the Wooli water tower. In fact, the system has been operational for over a year now capturing thousands of views during daylight hours of the dynamics of the beach in all different weathers. The eCoast team has analysed all that information and presented CCPA and CVC with the first annual report of their findings. This and subsequent reports will be important components in building an evidenced-based beach protection strategy. The Executive Summary will give you the headlines in a few pages but if you’d like to know more its all in the full report. Here are the full set of of pictures of Wooli beach taken so far by our camera system on the water tower. There’s a folder of pictures for each day. When you click on a folder you’ll see that there are three pics taken each hour. 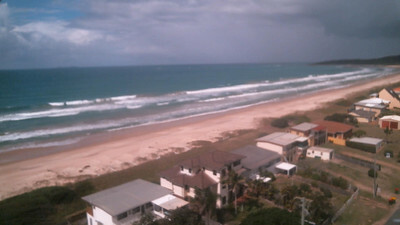 One picture looks north to Wilsons Headland, one looks south to Jones Beach and the third looks straight out to sea. Once we have collected several months worth of these pictures they will become a vital input into Wooli’s Beach Protection Strategy to be developed later this year. Congratulations and thanks to all those involved in getting the new camera system operational on top of Wooli’s 30m high water tower. In particular Bob Stack, Russ Stephens, Leone Coper, Dr. Shaw Mead, Pete and Janet Dunn, Al Hanson, Frank Vaarwerk (CVC) and Scott Lenton (CVC). As you can see from these first few pictures produced by our new beach surveillance system the results are stunning as they capture Wooli’s surf and beach conditions looking north, south and out to sea. Also looking stunning, or maybe stunned, are Russ and Al who helped Dr. Shaw Mead from eCoast Marine with the 20 ascents needed to haul 130kgs of equipment up the tower then assemble and install it. 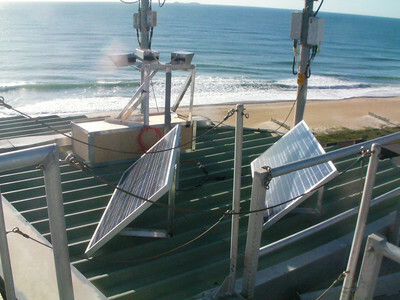 The system developed by eCoast comprises 3 high definition cameras, a computer and custom software plus solar panels and heavy duty batteries. It may look small peeking out between its Telstra and Optus neighbours but CCPA’s tower-cam is doing a big job. The system is recording hourly images which are uploaded to an internet server where they are processed to give a bird’s-eye view looking straight down on the beach. This data will be analysed to produce a regular report describing and quantifying changes in the beach position. This report, along with the beach survey data being produced by Brian Saye and his team are important steps in CCPA’s research programme aimed at understanding and quantifying the processes shaping our beach. This data, plus the underwater mapping which is now being planned will provide the basis for developing the Wooli Beach Protection Strategy. We need this strategy to argue successfully against the current draft plan which is based on a handful of point-in-time aerial photographs taken over the last 70 years. Further the darft plan does not take into account the vast amount of sand in the Wooli beach system, natural cycles (eg El Nino/lLa Nina ) and the impact of human activities. The $20,000 CCPA has invested for the implementation of tower-cam is a lot for a small community to raise but excellent value compared to other options at around $80,000. 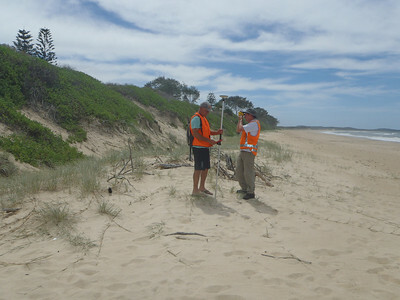 With the beach survey also being funded by CCPA, Council’s application to the State government for funding of tower-cam’s annual operating cost ($5-7,000) was an encouraging sign of reciprocation. We look forward to increasing cooperation with CVC as the substantial underwater mapping stage is undertaken. Taking hourly images is a very effective method of beach data collection. Commercial systems such as the ARGUS system (e.g. as used at the Gold Coast Reef) have been in operation for more than a decade. Cameras are positioned in a stable location as high as possible above the beach (e.g. 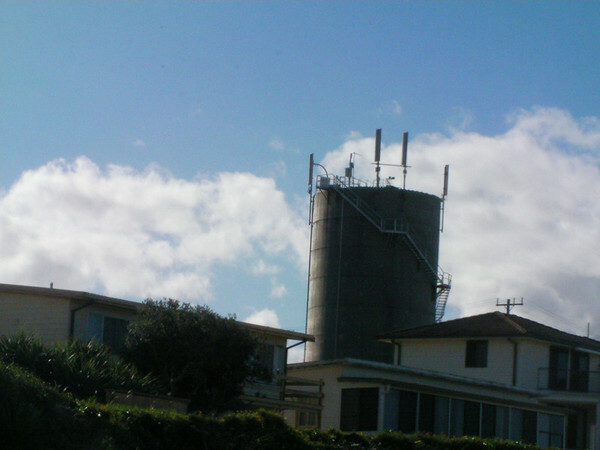 the water tower at Wooli), and images are collected and either stored or sent to a web-site. Images can then be analysed to develop a quantified understanding of beach response and trends. With today ‘s technology there are many inexpensive options such as an HD video camera in a housing using a smart-phone to transmit images, or a HD webcam sending images straight to the internet (as with many of the surfing forecast sites worldwide). It works well as long as the images are of high enough resolution and the camera location and elevation along with sufficient image control points are known. For example, ASR runs a very simple automated system at its technical headquarters in Raglan, New Zealand. Hourly images from high above the beach and harbour entrance are posted on www.snow.co.nz which are automatically downloaded to ASR ‘s server, automatically rectified and added to an archive tool that allows the user to visually assess the data, fit curves and trend lines to the harbour delta, match images of any period of time to the coincident wave and wind data, etc These rectified images provide a great deal of information on beach processes with respect to the surf-zone, which can be used to infer bars, rip-cells, etc. CCPA is in discussion with the Council to gain access to the water tower so that cameras can be mounted there. We are also working with CVC to cost the system with a view to applying for public funding if necessary.